It's probably not a surprise to my Loyal Readers that someone with a paper planner loves the written word. In my household, we take reading very seriously. For example, I read almost every night. I earned a perfect score in reading on the ACT during high school. I've drafted two novels and am mid-way through a third. My 4th grader reads way above level and reads for fun all the time! He brings a book everywhere. He almost wept in pleasure when the newest Percy Jackson arrived at the local library. He spends his pocket money on books for his Kindle. My mantle is even a shrine to Harry Potter. But every summer, the library does a reading program, Scholastic does a reading program, or the bookstore does a reading program. Then the local schools "challenge" the kids to log their reading as part of the contest. Sometimes, schools even require participation in the contest. If a kid WANTS to compete in a "who can read more" reading contest, that's cool. I get why libraries and book stores might create these summer reading contests and they are fine with me as an optional program. A self-motivated kid is going to be an enthusiastic reader. If a kid is a reluctant reader, he NEEDS to be forced to read. For my going-to-2nd-grader, mandatory reading is a wonderful thing. Still, logging is excessive. I say make life simpler and just say read for 20 minutes before bed. But for the high achieving reader who reads for pleasure all summer long, logging makes reading a chore! Logging causes resentment. Planners understand the feeling. We log stuff all the time. We might log while we are trying to learn a new routine (say, logging exercise all month) or reach a goal (say, logging cups of water). Eventually, we burn out on logging. But for a kid who picks up a book for fun, checking the start and end time of reading and walking over to the fridge to find the log and writing down the time and falling asleep book in hand so not knowing the time and getting stressed about losing the competition and being required to read...well, you can hear the overwhelm in his thoughts, right? Schools are so overworked and have to make choices for the majority of kids. I get that. In this case, however, they are demotivating reading in natural readers. They are ruining a great attitude and tradition. They are stealing away the pleasure of a good book and a glass of cold lemonade on the front porch. I say parents speak up to change that trend. Share with your friends on Facebook and let them know that reading logs should never be mandatory. Lemonade and good books all around! I worked in a library that ran one of these. We just counted the total number of books read on a list and answered questions to show they'd read the book. In exchange, once they'd read x number of books they got a badge and every child who took part got a certificate. The more books you read, the more badges you collected, but it wasn't a competition. For some kids reading a book was a big deal to be celebrated! 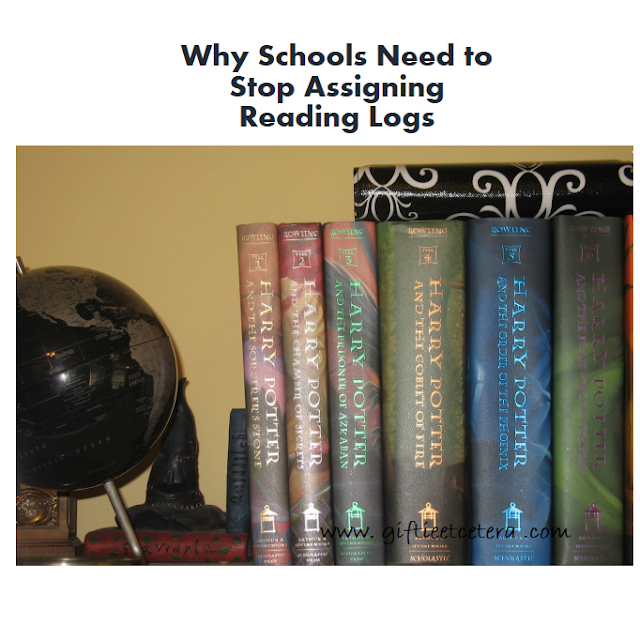 Because of the accelerated reader program and having to log books for the school constantly as they came up in school, my teenagers rarely read for pleasure anymore. However, programs like Accelerated Reader sucked the fun out of reading for a whole generation of kids. I don't think it was used as the creator intended, but schools put reading levels on books and many teachers insisted not just that you not read below your level, but that you not read ABOVE. Guess how many books that leaves to choose from? I say let them read WHATEVER if they will read (with a nod to checking the content). AR made reading seem like a task and it narrowed the literature available to kids. I'm not for that AT ALL. We are a family of readers and I completely agree with you! Schools are sucking the fun out of reading. My youngest (who is 13, going into 8th grade, and loves to write as well) is completely burned out from all the logging garbage. She is the one who falls asleep with a book in her hands and brings a book everywhere. This year however, they are "required" to read a book off a list of 12 "award nominees". And, none of these books come close to appealing to her or any of her friends. They aren't the great pieces of literature we remember as required reading (Animal Farm, Scarlet Letter, etc). They are just mediocre, period. And she hasn't read any of them. So, now I have to force my reader to read one. It's ridiculous IMO. Especially since she is a kid who picked up To Kill A Mockingbird this summer to read for fun. What happened to summer reading for enjoyment? Being required to read a few books for pleasure and bringing in a log of the names and authors? I definitely hated reading logs as a kid and I always felt it was more about quantity than quality. I say this as someone who loves to read and reads books all the time. I read even more books when I was in school and spent all my extra money on books for the most part. It's just not a good system for encouraging kids to read, in my opinion. thanks for this post! I now work at a library, and our summer reading program allows kids to count any time they spend reading from the beginning of the summer. It's "color in the clock for each hour" and then at 25 hours you turn it in. That seems to work fairly well. I used to love doing the reading challenge when I was a kid! All you had to do was read any six books (just one per week for the six week holiday!) Then you would get the librarian come into school and give out certificates, every year they had a different theme and you got stickers or something it was so much fun! I love the read for 20 idea and please LET THEM CHOOSE WHAT they want to read, do not assign it. The Accelerated Reader program in my kids elementary school ruined their love of reading, and not just my boys, most of their friends. I have written a couple rants about these programs, for the most part they fail to achieve their goal. I can hear in the tone of the comments that people are passionate about their books. That makes me happy (even if you disagree with me :) ). I very much agree with your complaints about mandatory reading & logging. It WOULD ruin a lot of the fun of summer reading. I think public schools are really meddling into family life too much when they start filling the summers with school work. You have hit the nail on the head with this one. I believe you're absolutely right about getting burned out on logging. It's the same reason I quit using MyFitnessPal. And it has to be one of the reasons my son has lost interest in the summer reading program the past few years. Sorry for the mini-novel-length rant or whatever you want to call this comment. lol It's just that this topic really gets me going. And from what I see here, I'm not the only one. Thanks for yet another awesome post! PS--He's starting fifth grade today. Wish us luck! We are definitely going to need it. 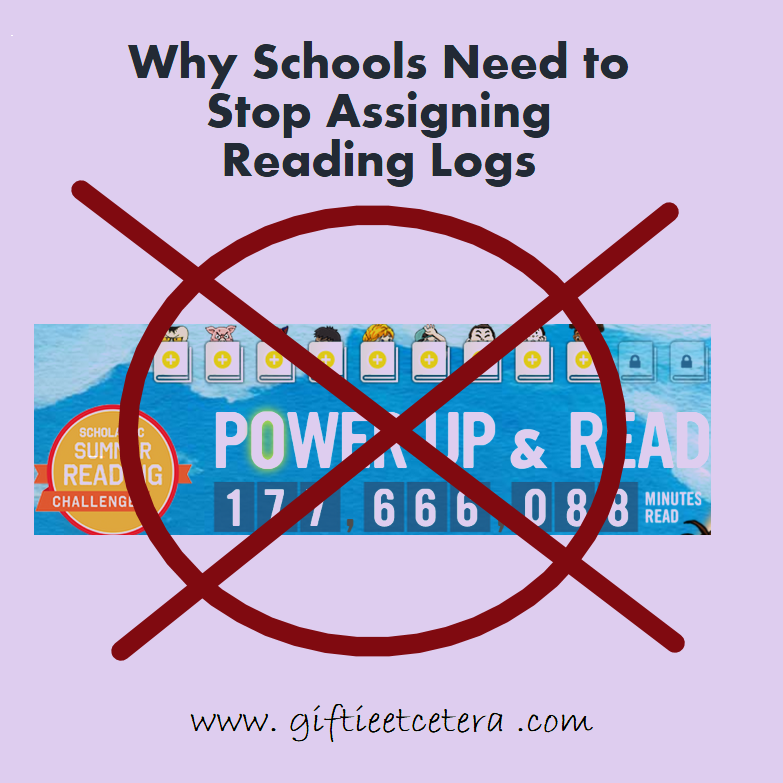 We haven't had to do reading logs (homeschooling in Congo gives you lots of control over your programs!) But I would be against anything that makes reading boring instead of fun. The contests are nice because they are optional. Kids can participate or not- generally no pressure. I've been a huge reader since I was about six. I LOVED Accelerated Reader (probably because I placed first or second every year). I also loved my local library's summer reading programs. We just counted total books, and once you hit a number, like 15 or 25 or something, you got a medal. There wasn't a special prize for reading the most books or hitting the limit first--although I totally could have won both of those. Schools reward natural athletes, so I don't see the problem with rewarding natural readers. I didn't resent the kids for getting prizes in art or sports or music. It would be hypocritical to suggest rewards couldn't also be given for things like reading. While I do think it's okay and normal for schools to require kids to read a certain book or books during the summer, I agree with you that schools shouldn't require summer reading logs. What about kids who go away for camp, or who spend large parts of the summer visiting family? I don't think recording a log is that big of a deal at home, but it's more difficult on vacation. I have a love-hate relationship with these reading logs. We don't have to do them for school but we do them for the summer reading programs. I like that I can keep track of things but I don't have time to write down every single time they read--because the 6-year old doesn't really get it, and I have to do it for her. Not to mention trying to keep track of the in between times she reads. You made some good points. Thanks for stopping by to link up at Tips & Tricks Tuesday! Can I Use a Planner That's Not Perfect For Me? Cheaper to Eat at Home? Or on the Road?